On Thursday, Counselor to President Trump, Kellyanne Conway was interviewed by Chris Matthews. 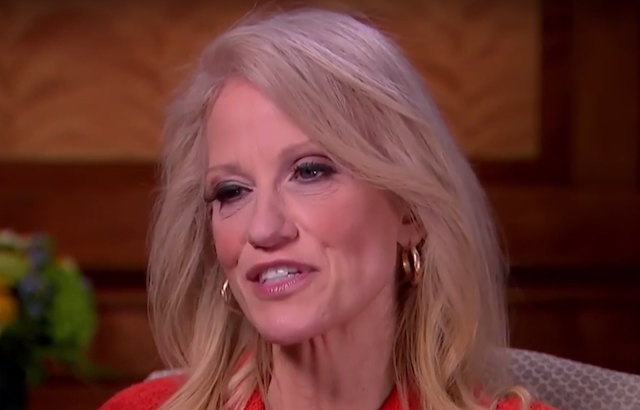 During their conversation, Ms. Conway referenced a "Bowling Green Massacre" - an event which never occurred. Some of her nonverbal signals during this specific potion of the interview are discussed here. At 2:42 in the above video, Ms. Conway continues, "... Um, I, I bet, there was very little coverage — I bet, I bet it's brand new information to people - that President Obama had a six-month ban on the Iraqi refugee program after - two Iraqis came here to this country, were radicalized — and they were the master, masterminds behind the Bowling Green massacre. I mean, most people don't know that because it didn't get covered ..."
During the last portion of this specific statement, Kellyanne Conway displays a partially suppressed smile - and smiling out of context (whether suppressing it or not) should always set off alarm bells. Lets consider the two possible explanations behind this nonverbal display. Consider for a moment, that Ms. Conway was truly misspeaking and she was thinking of a different (but actual) massacre and simply was confusing the name of the city where it had occurred. In this situation we must ask: Why is she experiencing joy (and expressing this via a suppressed smile) when people were brutally murdered? Answer: In such a scenario, she would be taking pleasure in the act of making her point and winning an argument. Yet to take any type of pleasure at the expense of others' violent death is a form of malice. Kellyanne Conway knew there was no such "Bowling Green Massacre" when she made her statement but she was attempting to deceive Chris Matthews (as well as the public) that such an event took place. How then do we explain her smile? Answer: This would be a manifestation of what is termed "Duping Delight". If this second scenario is true, the duping delight would indicate that Conway was believing that she had successfully lied - and she was taking sincere joy in this belief.